I first read Dracula in the tenth or eleventh grade; I still own the Signet paperback edition (which makes it almost 30 years old). It started a love affair with the vampire that had me reading some really crappy stuff in my late high school/early college years. It also had me reading some very good stuff - Chelsea Quinn Yarbro, Suzy McKee Charnas, Les Daniels, etc. When I saw that one of my libraries had it in a Playaway version (read by Robert Whitfield), and I was looking for something to listen to in the car, I checked it out. * I haven't finished auditing it yet but I have come to the conclusion that - regardless of the competence of the reader, and Whitfield isn't bad - Dracula is one of those books best read in silentio sed non clara (my apologies to Dr. Lofstedt on my mangling of the Latin). Reading to oneself, you can skim over the mawkish insufferability of Van Helsing** or the suffocating machismo of "the men," as they try to protect Mina from the unspeakable horrors of Dracula's machinations. On the other hand, read aloud, you catch things that over familiarity with the text makes you miss (similar to my experience listening to The Silmarillion a few years back) so, overall, auditing the book has been a positive experience. 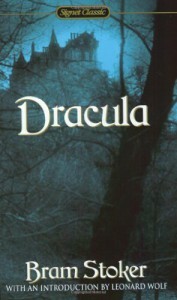 Though you may not end up liking it, Dracula is one of those genre classics that a fan has to read at some point. Like Tolkien's LotR in the fantasy genre, it set the standard by which vampire fiction is measured or which authors rebel against. * Despite the season (it's October 31 as I write these words), I didn't consciously pick it up in homage to Hallowe'en. If this were March, I still would have checked it out. ** Anthony Hopkins nailed the good doctor in Coppola's filmed version; if only the director had been as perceptive in casting nearly every other role.